Parents love to celebrate and share their children’s many “firsts” as they age – first word, first step, first story time, first catch and for some people even the first vaccination. Many also wonder if their child’s development is on track. The new Shot@Life mobile app offers a fun way for parents to both evaluate and digitally scrapbook these “aww” moments from birth to 5 years old. As an added bonus, parents will become aware that 1.5 million children (one every 20 seconds) around the world die each year from a vaccine-preventable disease and don’t celebrate these universal milestones. Awareness is created by global health facts and statistics found in the app as well when users share their child’s Shot@Life “styled” photos via email, Facebook or Twitter. The UN Foundation teamed up with the American Academy of Pediatrics to create and offer the free app for Apple iOS and Android. 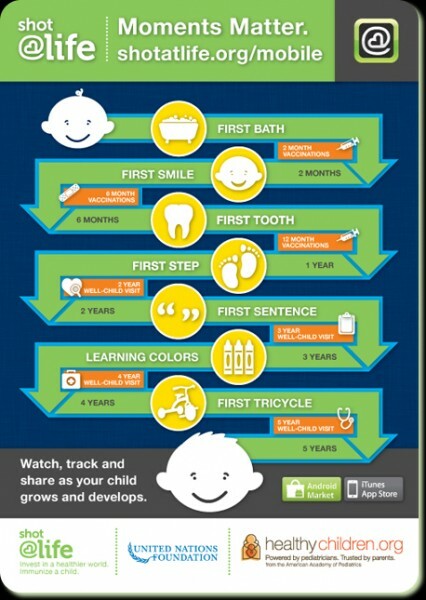 According to Julie Tsirambidis, a board-certified nurse practitioner at Akron Children’s Hospital Pediatrics in Brecksville, it’s an easy-to-use, credible resource for parents to learn developmentally appropriate milestones and new, fun activities to try based on their child’s age. “If parents use something like this app in the comfort of their daily life, I believe they’ll be better educated to bring concerns and observations to medical providers at the child’s well visits or even sooner,” she said. It only takes a few seconds to create a profile for your child: nickname, photo and date of birth are the only necessary items. Then you’re free to scroll through the Milestone Tracker and document a milestone with the completion date, a photo, notes or a simple checkmark. Photos can be organized by milestone or in albums and easily shared with friends via email, Facebook or Twitter.